Our design group specializes in audio, video, lighting, rigging, and control systems for any type of performance venue including theaters, black boxes, casinos, nightclubs, boardrooms, classrooms, and television studios. We are able to begin designing and contribute at any phase of the project from initial programming, schematic design, and as late as design development. Some projects require full construction/permit documents, while others require design drawings only. Have a need for engineered drawings, we can do that too. 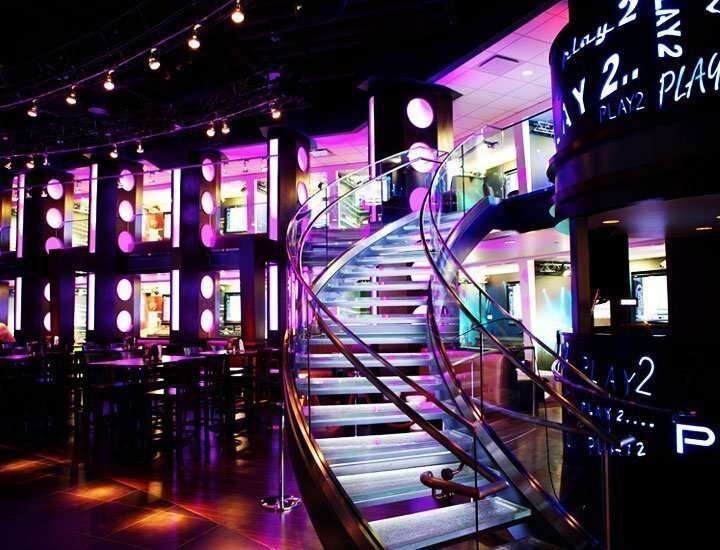 Theatrical and Architectural Lighting supply including customized track fixtures. The 150,000 square-foot NASCAR Hall of Fame is an interactive, entertainment attraction honoring the history and heritage of NASCAR. The high-tech venue, designed to educate and entertain race fans and non-fans alike, includes artifacts, interactive exhibits, a 275-person state-of-the-art theater, broadcast studio, restaurants and a Gear Shop. Massive integrated audiovisual, lighting and control systems throughout the 260,000 square foot casino. Established in 1746, Princeton University is one of seven “Ivy League” colleges and perhaps the most recognized and esteemed university in the world. The sprawling grounds consist of 180 buildings on a 500 acre campus and the University includes such notable alumni as Presidents James Madison, Woodrow Wilson and John F. Kennedy, First Lady Michele Obama, and US Supreme Court justices Samuel Alito, Elena Kagen and Sonia Sotomayor to name a few. Starlite Productions is honored to have been trusted to provide engineered audiovisual, lighting, dimming and control solutions to this prestigious and esteemed institution. -Interfacing with clients and job sites to document customer requirements and job site conditions. -Review pre-construction design and documentation, providing assistance with technical design and pricing for proposals as needed. -Work directly with clients, architects, consultants and staff throughout the design development and delivery process with Supervisor support. -Provide designs and specifications for lighting, rigging and control systems. -Develop statement of work for each job based on system design and customer requirements. -Responsible for job documentation as needed. -Conduct equipment research on new and existing technology for client applications. -Site surveys as needed, create job cost estimates for bids if required and continue to, review and approve Systems Descriptions. -Provide technical response to the customer RFP/RFQ/RFI. -Be capable of working effectively and efficiently with support from other members of the engineering team. -Maintain complete and accurate project documentation and records. -Identify all cabling and miscellaneous materials for project. -Assist Account Managers with development of system proposals and labor estimates. -Communicate effectively with internal staff, client representatives, cooperative trade and subcontractors. -Effectively coordinate and manage multiple system design projects. -Be responsible for successfully completing assignments on time and within budget. -Establish and maintain an effective line of communication with the client acting as liaison in support of the Account Manager. -Develop and conform to company technical standards and practices. -Correctly interpret multiple formats of technical specifications, schematic drawing and architectural diagrams. -Perform other job related duties or special projects as required. Provide prompt, courteous and excellent service to all customers, operate in an ethical manner in accordance with State and Federal law, the company’s Standard Operating Procedures (SOP), Affirmative Action, Diversity, employee handbook, applicable compliance and operations policies and procedures and other policies of the company. Possess a high degree of integrity and actively cooperate and interact with all entities of Starlite Productions. The prestigious Baldwin School hired Starlite to work with general contractors, engineers, electricians and architechts on transforming their gymnasium space, previously called Diamond Hall, into a multi-purpose performance/event venue that could host musicals, concerts, lectures as well as theatrical performances. Prior to the update, the school would hold small scale productions in various hallways or open spaces throughout the school. 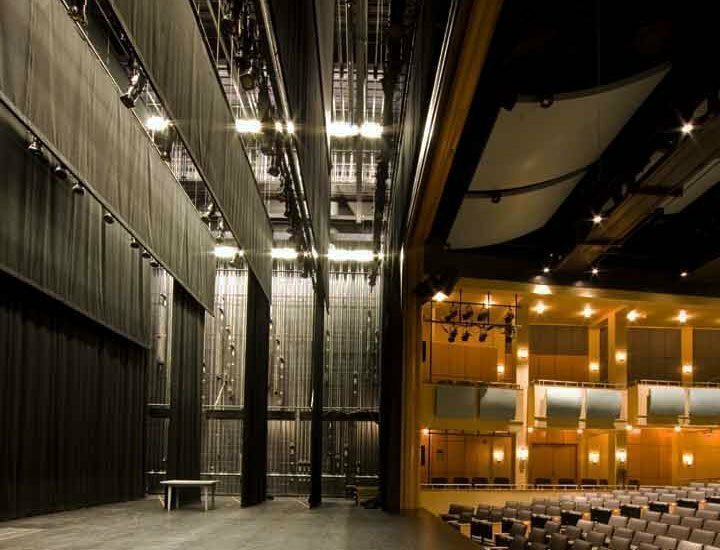 The Simpson Center for Performing Arts now boasts a 45’x45’ pipe grid from which to hang lights, scenery and drapery, sound reinforcement, distributed audio/video, video projection, acoustical curtains and track systems, performance space house lighting and of course, theatrical lighting. The Philadelphia International Festival of the Arts (PIFA) took over stages, museums and public spaces for 25 days in a $10 million, first-time arts extravaganza. PIFA featured 31 commissions, 135 events and more than 140 arts partners as diverse as aerialists Compagnie Transe Express and the hip-hop group Watcha Clan. Starlite Productions provided the main outdoor sound system for the event which was mounted on the 8th-floor of City Hall, some 127 feet from street level. Lankenau Hospital has been defining medicine for 150 years. This Black-Tie Gala was a celebration of the extraordinary milestone of its 150th Anniversary as well as the kickoff of a $500 million transformation already underway and the rebranding of their name to the more apt Lankenau Medical Center. The event was held at the historic Philadelphia Museum of Art, which dates to 1877, and houses over 225,000 works of art and is one of the largest museums in the United States. Staging an event of this size while the museum remained opened to the public created its own set of challenges which our team readily handled. Since 2009, Starlite Productions has worked with D&M Professional, whose brands include Denon Professional, Marantz Professional and Denon DJ on their trade show booths at the International DJ Expo shows in Atlantic City as well as the NAMM shows held in Anaheim, California each year. The booth design varies from year-to-year but always includes an impressive array of lighting, video and, of course audio. This year’s booth design was no different and showcased Denon’s latest product offerings and included live demonstrations from world-renown DJ’s. Each year, Bucknellians come from far and wide returning to their alma mater, Bucknell University, for an alumni weekend that never disappoints. The finale of the weekend is the famed Alumni Tent Party expertly produced by the creative team at Feats Inc. Starlite provides the décor and dance floor lighting as well as PA for the massive tent structure. This year, Urban Guerilla Orchestra took to the stage and rocked the house as guests flooded the dance floor. All told, two tractor trailers worth of production gear and five days of setup culminate in an epic party that would make any Bucknellian proud. Wigs and Wishes is an annual event hosted by celebrity hair stylist Martino Cartier and the organization he launched, Friends Are by Your Side. The goal of the organization is to restore dignity to women who lost their hair to chemotherapy by providing them with beautifully-styled wigs. It’s much more than wigs though. Friends Are by Your Side also grants wishes to children and families who truly need a miracle. Each year Starlite provides all of the production support for the Wigs and Wishes event to ensure that the message of this very worthy cause is heard and seen clearly. An LED video wall with satellite 80” LED displays flanking the stage provide the backdrop along with full HD IMAG and engineering with video playback. The event requires all hands on deck to complete two stages each with its own robust lighting and audio system for the one-day load-in, show, and out. The event has featured performances by Liv Divine, Paula Abdul, and Reuben Studdard. The Walter E. Washington Convention Center located in Washington DC set the stage for the United State of Women Summit. The one-day conference sets out to empower and educate women while celebrating their achievements, addressing gender equality issues, and focusing on the important work that still has to be done. Starlite in collaboration with California based company BP Productions provided the lighting system for the event. The design implemented Clay Paky Mythos and K20 B-EYEs, Vari-Lite VL3500 Spots, Elation Color Chorus, and Martin RushPar2 Zooms all driven by a full-size GrandMA2. Saint Elizabeth Roman Catholic Church’s stunning new home which was built from the ground up includes a top-notch, fully engineered sound reinforcement system that consists of JBL Architectural Series loudspeakers which were meticulously custom stained to match the sanctuary interior including custom painting of the grilles to match the chandeliers. The system also includes a digital console and an ADA assistive listening system. The Democratic National Convention in Philadelphia is in full swing and the city commissioned a special touch, implemented by Starlite Productions of Moorestown, NJ and design in collaboration with The Lighting Practice of Philadelphia, PA. The teams collaborated to deliver new life to Philly’s 30th Station and City Hall with a creative and patriotic-themed lighting project which vividly illuminates both historic landmarks for the 2016 DNC. The lighting design for each landmark dictated a combination of powerful LED-wash lights as well as long-throw profile units for pattern projection of the various patriotic themed elements.Two things were critical when specifying the equipment for the month long project – The lighting units had to be really impactful and they had to be weatherproof. That’s why Starlite’s VP of Event Technology, Jason Danowitz, chose SGM’s P5 High Performance outdoor LED wash units and Clay Paky Mythos fixtures housed in Clay Paky Igloo enclosures as the real workhorses of the design. The design also features an interior lighting package illuminating the east and west windows of the 30th Street Statin using dozens of Elation’s Color Chorus linear RGBA fixtures. For 30th Street Station the choice console was the ETC Ion and a full size grandMA 2 with an NPU processor for City Hall and Avenue of the Arts architectural system. In this 2,500 square-foot, fully wired classroom / meeting facility / public exhibit space, cadets may view historical artifacts and experience virtual and interactive activities. The system supports satellite linkups with other learning institutions around the world and the flexible space accommodates a seating platform that can be removed for events. Various training classes, luncheons, concerts and other events are hosted here. The project is the gift of the West Point class of 1954. When PRG Chicago needed a local partner to pull off a pop-up political event in Philadelphia, they relied on Starlite to deliver. Former President Bill Clinton addressed a crowd of supporters for the Hillary Clinton Presidential Campaign. With notice only hours prior to Load-in, Starlite was able to organize all of the critical production elements including power generation, lighting for press, staging with scenic elements, PA with distribution for press, and barricade. During the Papal Visit to Philadelphia, Starlite teamed up with a local artist for a unique project. The team was tasked with projecting religious imagery onto the oxidized dome of the Basilica of Saints Peter & Paul. This once in a lifetime project required the use of the Hippotizer media server as well as a 40,000 lumen, HDQ 2K40 projector, which weighed approximately 400 pounds. The images were projected on the dome every evening throughout the Papal Visit.